January 8, 2015 – It’s been a hectic day! Along with our mid-day pet sits today, we have our multi-dog family of five with us still, until tomorrow (unless the snow squalls get in the way!) These guys are regular visitors and we love them like our own. Today was different, though. Today we introduced another dog for the night. We’ve never brought anyone new to the mix when they’re with us because, in this case, the mix is big enough! We’ve had dogs here from different families before, but no more than three in total. Still, according to our past experiences and the trainers I’ve read online, the steps we followed are the safest and most comfortable for the dogs when being introduced. Since dogs use their noses to get to know each other, we’ve had our best results when we can take our time and let them find the other dog’s scent in the room or yard without forcing the dogs to meet right away. Most clients are good with this. They trust us to work through a peaceful introduction. This afternoon we asked our client (who we know well from many other vacation sits at their place) if she would bring her dog into the backyard. She kept her on the leash and walked the little trails my husband had carved out with the snowblower, stopping here and there to let her dog sniff and pee. Once they felt comfortable with that, they came into the laundry room with their dog and we let the five dogs out the sliding doors from the kitchen. Now they all had an opportunity to meet each other through their nose! The new visitor enjoyed a good look around the inside of the house at the same time. Normally our home would be neutral territory for any dogs to meet, but in this case, the five dogs are here so often they have a bit of a claim on it. We had expected this to mean they’d be less stressed and perhaps a little territorial while the new dog would be nervous. It turned out, everyone was nervous! For the first hour, we kept a large gate up between them once the six were all inside at last. We kept our voices low and calm and eventually the cacophony of barking ceased and they just watched each other. Wow! That was easy. Gradually one dog after another was let into the living room with the new dog. One of the big ones kept barking on and off and we were a bit concerned about letting her through, but it turned out she was just worried about losing her spot on the sofa! Is that the end of it? Absolutely not! We’ll have eyes on them at all times when they’re together and if we should go out before she goes home (which we have no plans for) we’ll keep her door firmly closed. 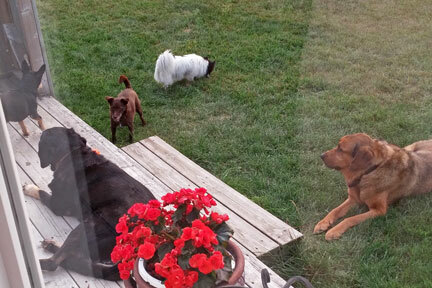 Six dogs, and a bird, and us…should be a cozy winter night!